Here is the list of the hotels near Sainte-Soline. Book your hotel near Sainte-Soline today, Thursday 09 May for the best price, reservation and cancellation free of charge thanks to our partner Booking.com, leader in on-line hotels reservation. Below here is the list the 50 closest hotels of Sainte-Soline, sortable according your criteria. You will find the position of these accommodations on the Sainte-Soline hotels map. Offering a garden, Couette et Café provides accommodation in Lezay. Complimentary WiFi is provided. There is a fully equipped private bathroom with shower and a hair dryer. All rooms have a clothes rack. A continental breakfast is served each morning at the property. A home-cooked dinner can be enjoyed at an extra fee if reserved at least 1 day in advance. Poitiers is 45 km from Couette et Café, while Niort is 36 km away. The nearest airport is Poitiers-Biard Airport, 44 km from the property. Offering free WiFi and an outdoor pool, Les Cerisiers Gîtes is located in Lezay. Poitiers is 43 km from the property. Free private parking is available on site. The holiday homes all feature a dining area and seating area with a flat-screen TV. There is also a kitchen, equipped with a dishwasher, oven and microwave. A coffee machine and a kettle are also available. Every unit is equipped with a private bathroom with a hairdryer. Towels are featured. Each accommodation at Les Cerisiers Gîtes also includes a private pool, garden and barbecue. You can play tennis at the property, and the area is popular for horse riding. The area is popular for fishing and canoeing. Niort is 35 km from Les Cerisiers Gîtes, while Parthenay is 45 km away. The nearest airport is Poitiers Airport, 42 km from Les Cerisiers Gîtes. Chez Clemley offers B&B accommodation just a 2-minute drive from the centre of Lezay and 13 km from Rom. It offers free Wi-Fi access and a terrace with outdoor furniture. Rooms are individually decorated and feature a wardrobe and a private bathroom with a shower. Iron facilities are provided upon request. Guests are invited to enjoy a daily continental breakfast in the dining room. Facilities for making tea and coffee are available in the shared seating area and restaurants can be found in Melle, which is 14 km away. Chez Clemley is 4 km from the Chaboussant Pond, where guests can go fishing. On Tuesdays, you can visit the local market located 2 km away. Free private parking is available on site. Set in Saint-Vincent-la-Châtre, Holiday home La Martinière O-781 provides accommodation with a private pool and private parking. The accommodation is 42 km from Niort. The holiday home includes a living room with a TV and a DVD player. The kitchen features a dishwasher. The holiday home offers an outdoor pool. The nearest airport is Poitiers-Biard Airport, 59 km from Holiday home La Martinière O-781. Located in Lezay, this non-smoking detached holiday home boasts views of the garden and offers BBQ facilities. It is 57 km from Poitiers. The holiday home features a living room, a dining and kitchen area as well as a shower room and toilet. Bed linen and towels are provided. Guests can enjoy the fitness room available on site. The property is 39 km from Niort Train Station. Holiday home Rue de la Metecharie P-782 is located in Clussais-la-Pommeraie. This 4-star holiday home features an outdoor pool and free WiFi. This holiday home features 2 bedrooms, a living room and a fully equipped kitchen with a microwave and a fridge. Niort is 47 km from the holiday home. The nearest airport is Poitiers-Biard Airport, 69 km from Holiday home Rue de la Metecharie P-782. Boasting accommodation with a terrace, Les Rosieres is set in Clussais-la-Pommeraie. With pool views, this accommodation offers a swimming pool. The villa is equipped with 5 bedrooms and a fully fitted kitchen with a dishwasher. A flat-screen TV with satellite channels is available. The villa offers a barbecue. Guests can relax in the garden at the property. Niort is 47 km from Les Rosieres. The nearest airport is Poitiers-Biard Airport, 69 km from the accommodation. Holiday home Lage H-783 is set in Messé. This holiday home also features a private pool. The holiday home is equipped with 2 bedrooms, a TV and a fully equipped kitchen that provides guests with a microwave, a fridge, a washing machine and a stovetop. The holiday home offers an outdoor pool. Poitiers is 43 km from Holiday home Lage H-783. The nearest airport is Poitiers-Biard Airport, 43 km from the property. Holiday home Chemin du Mitan 1 is set in Saint-Vincent-la-Châtre and offers barbecue facilities. Guests staying at this holiday home have access to free WiFi and a fully equipped kitchen. The holiday home is fitted with a satellite TV. The holiday home offers an outdoor pool. Niort is 42 km from Holiday home Chemin du Mitan 1. Poitiers-Biard Airport is 62 km away. Boasting an outdoor pool and garden views, Holiday home Chemin du Mitan 2 is situated in Saint-Vincent-la-Châtre. Guests have access to free WiFi. This holiday home comes with a seating area, a TV, a DVD player and a kitchen with a dishwasher. The holiday home offers a barbecue. Niort is 42 km from Holiday home Chemin du Mitan 2. The nearest airport is Poitiers-Biard Airport, 62 km from the property. Boasting an outdoor pool and garden views, Holiday home Chemin du Mitan is situated in Saint-Vincent-la-Châtre. Guests have access to free WiFi. The holiday home features 4 bedrooms, a TV with satellite channels and a fully equipped kitchen that provides guests with a dishwasher. The holiday home offers a barbecue. Niort is 42 km from Holiday home Chemin du Mitan. Poitiers-Biard Airport is 62 km away. Featuring barbecue facilities, Holiday home Chemin du Mitan 3 features accommodation in Saint-Vincent-la-Châtre with free WiFi and garden views. The accommodation is 41 km from Niort. The holiday home has 4 bedrooms, a TV with satellite channels and a fully equipped kitchen that provides guests with a dishwasher. The holiday home offers an outdoor pool. The nearest airport is Poitiers-Biard Airport, 74 km from Holiday home Chemin du Mitan 3. Set in Rom, this apartment is in a hamlet of just 6 houses and features a barbecue and a plunge pool. The property is 35 km from Poitiers and free private parking is available. Free WiFi is provided . Located on the 1st floor, this apartment has views of the garden from all the bedrooms. An oven and a microwave can be found in the kitchen. Towels and bed linen are featured. Niort is 46 km from La Maison D'ete, while Chasseneuil-du-Poitou is 43 km from the property. The nearest airport is Poitiers Airport, 34 km from the property. Hotel Maisonnay Preferred hotel ! Featuring an outdoor swimming pool with a sun terrace, Motel La Fleur is located 7 km from the town of Melle. A flat-screen TV and a small balcony feature in the guest rooms, which have a simple décor. Each room has a private bathroom fitted with a shower or a bathtub. You can enjoy a drink in the bar while reading the newspapers provided, and packed lunches are available upon request. Free WiFi access is provided in all areas and in all rooms. There is also a children’s playground. Free private parking is available on site and you can visit Niort, 36 km away. This motel is accessible via the A10 motorway. Located in the village of Chenay in the heart of the Poitou-Charentes region, this guesthouse offers a heated outdoor swimming pool and a garden with a terrace. Guest rooms at Les Chenets are simply furnished and offer free Wi-Fi internet access. They have a view of the surrounding gardens. A continental breakfast is served each morning in the rustic dining room at Les Chenets. When the weather is nice, guests are invited to relax on the terrace with sunloungers. Other relaxation activities available include ping-pong facilities. The guesthouse is located 42 km from the centre of Poitiers. The Museum of Tumulus de Bougon, specialising in Neolithic history, is 10 km away. Boasting a bar and free WiFi, Les 3 Pigeons is set in Chenay. The in-house restaurant serves French cuisine. At the hotel, every room is equipped with a desk, a flat-screen TV and a private bathroom. The units include a wardrobe. Guests at Les 3 Pigeons can enjoy a continental or a buffet breakfast. Cycling is among the activities that guests can enjoy near the accommodation. Poitiers is 42 km from Les 3 Pigeons, while Niort is 46 km away. The nearest airport is Poitiers-Biard Airport, 42 km from the property. Located in the village of Chaunay, in the heart of the Poitou-Charentes region, this hotel offers a bar and restaurant. With free parking, it is situated a 40-minute drive from the centre of Poitiers. With free WiFi access, the guest rooms are elegantly decorated and located on the upper floors of the hotel. They are each equipped with an LCD TV, telephone and en suite bathroom with a bathtub or shower. A continental breakfast is served each morning at the hotel. For other meals, guests can enjoy traditional French dishes in the restaurant, or relax with a drink in the bar area. A hairdresser, a bakery, and a pharmacy are located just 50 metres from the hotel. Guest accommodation Sepvret Preferred hotel ! Offering a seasonal outdoor swimming pool, a games room and a garden with a trampoline and barbecue facilities, La Grosse Talle offers authentic cottages in Sepvret. Free Wi-Fi access is available. Each cottage has a kitchen and a bathroom with a shower. There is also a dining area and a seating area, and some cottages have a TV and a washing machine. An array of activities can be enjoyed on site or in the surroundings, including a library and table tennis. Niort and its train station are 30 km away and there is free parking at La Grosse Talle. The Futuroscope theme park is 49 km away. A typical castle from the 19th century situated in the heart of Poitou, 10 km from Melle, Vivre Nature au Château is surrounded by a 4-acre park and offers relaxing massages upon request. The bedrooms are situated on the second floor and have views of the park and its centenary trees. They have wooden floors and a private shower room. Breakfast consists of organic produce including bread, local pastries, fruit juice, dry and fresh fruit and hot beverages. A restaurant serving traditional dishes and pizzas can be found in Chef-Boutonne 6 km away. Javarzay Castle can be discovered 6 km away and there is free parking at the property. Offering free WiFi and garden views, Les Rosiers is an accommodation located in Chaunay. Guests staying at this holiday home have access to a fully equipped kitchen. The holiday home has 1 bedroom and 1 bathroom with free toiletries. A flat-screen TV with satellite channels is featured. Poitiers is 49 km from the holiday home. Poitiers-Biard Airport is 49 km from the property. Offering free WiFi and pool views, Cottage Chez Coudret II is an accommodation situated in Brux. The property features garden views. The holiday home includes 1 bedroom and a kitchen with a dishwasher and an oven. The holiday home offers an outdoor pool. Barbecue facilities are provided. Poitiers is 45 km from Cottage Chez Coudret II. The nearest airport is Poitiers-Biard Airport, 45 km from the accommodation. Cottage Chez Coudret I is located in Brux and offers barbecue facilities. Free WiFi is offered. The holiday home comes with 2 bedrooms, a TV with satellite channels and a fully equipped kitchen that provides guests with a dishwasher, an oven, a washing machine and a microwave. The holiday home offers an outdoor pool. Poitiers is 45 km from Cottage Chez Coudret I. Poitiers-Biard Airport is 45 km away. Offering free WiFi and pool views, Holiday Home Chez Coudret is an accommodation situated in Brux. The accommodation is 45 km from Poitiers. The holiday home comes with 2 bedrooms and a fully fitted kitchen with a dishwasher and an oven. A TV and DVD player are available. The holiday home offers an outdoor pool. Barbecue facilities are available. The nearest airport is Poitiers-Biard Airport, 45 km from Holiday Home Chez Coudret. Bed and Breakfast Gournay-Loizé Preferred hotel ! Guest accommodation Vaux Preferred hotel ! Situated in Vaux, Gite features accommodation with a terrace and free WiFi. 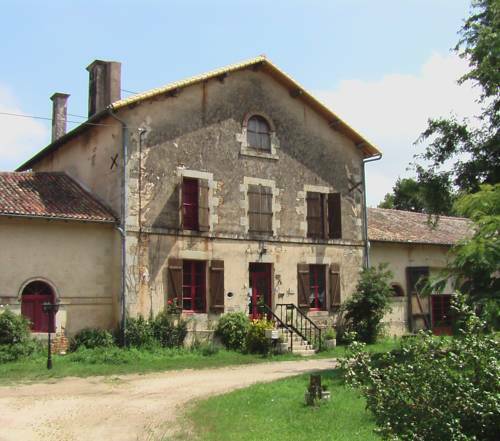 The property has garden views and is 37 km from Poitiers. The holiday home consists of 1 bedroom, a kitchen with dining area, and 1 bathroom. A flat-screen TV and DVD player are provided. There is a garden at this property and guests can go hiking nearby. Chasseneuil-du-Poitou is 46 km from the holiday home. The nearest airport is Poitiers-Biard Airport, 37 km from the property. Set in Champagné-le-Sec in the Poitou-Charentes Region, this semi-detached holiday home is 45 km from Poitiers. Guests benefit from free WiFi and private parking available on site. There is a seating area and a kitchen complete with an oven and a microwave. A flat-screen TV is provided. Other facilities at La Greletterie include a barbecue. Featuring free WiFi, a seasonal outdoor pool and a terrace, la nougeraie offers pet-friendly accommodation in Exoudun, 44 km from Poitiers. Guests can enjoy the on-site restaurant. Free private parking is available on site. You will find a coffee machine in the room. Extras include free toiletries and a hairdryer. Homemade evening meals prepared with fresh local produce are available upon reservation 24 hours in advance. You can play billiards at this bed and breakfast, and bike hire is available. Niort is 28 km from la nougeraie, while Parthenay is 38 km away. La Rochelle - Ile de Re Airport is 85 km from the property. Set in Sauzé-Vaussais, Chambres d'hôtes du puy d'anché provides a garden and shared lounge. Both free WiFi and private parking are available at this property. The rooms in the guest house are fitted with a flat-screen TV. Guests at Chambres d'hôtes du puy d'anché can enjoy a continental breakfast. A variety of popular activities are available in the area around the property, including cycling and hiking. Poitiers-Biard Airport is 60 km away. Offering a tennis court, Village Vacances du Puy d'Anché is located 2.5 km from Sauzé-Vaussais. Here, guests can enjoy a holiday home with TV, heating and WiFi access. Each 2-bedroom house includes a furnished terrace with barbecue and a seating area. There is also a kitchen equipped with a microwave and an oven, and the private bathroom comes with a shower. Barbecue facilities are at guests’ disposal. Bicycling and hiking can be enjoyed in the surroundings. The property offers free parking and is located 60 km from Poitiers Train Station. Set in Melle, Les Glycines offers air-conditioned rooms with free WiFi. The property features a bar, as well as a restaurant serving Local cuisine. The hotel provides city views and a terrace. At the hotel, each room includes a wardrobe and a flat-screen TV. The private bathroom is equipped with free toiletries. A continental or buffet breakfast can be enjoyed at the property. Niort is 31 km from Les Glycines. The nearest airport is Poitiers-Biard Airport, 58 km from the accommodation. Situated in Sauzé-Vaussais, Gites dans les Champs features accommodation with a flat-screen TV and a kitchen. Complimentary WiFi is provided. Each unit has an oven, microwave, a coffee machine, as well as a toaster and kettle. There is a fully equipped private bathroom with shower and a hair dryer. The holiday home offers an outdoor pool. A barbecue and a terrace are available for guests at the property to use. The nearest airport is Poitiers-Biard Airport, 62 km from the property. Chatenet is a B&B offering a seasonal outdoor swimming pool, sun terrace and table tennis. The property is located 15 km from Ruffec. There is free WiFi available and free private parking. The property features a 3-acre garden with free-roaming chickens, ducks and guinea pigs. In the morning, a continental breakfast is served. Tastefully and simply decorated, the rooms at Chatenet all have a private bathroom with shower and toilet. Some rooms also feature garden views. The N10 road is less than 5 km from the property which is located on the D113 road towards Theil. There is free on-site parking. Le Chatenet Gite is located in Limalonges and offers a seasonal outdoor swimming pool. It features barbecue facilities, pool views and free WiFi. This holiday home has a terrace, a living room and a flat-screen TV with DVD player. The property also has 2 bathrooms is equipped with a shower. Guests can also relax in the garden. Poitiers-Biard Airport is 58 km away. Boasting free bikes and a garden, Chambre d'hotes Le Fourniou is situated in Melle. This B&B features luggage storage space and a terrace. The accommodation is completely separate from the property owners living space. The room is equipped with a microwave, toaster, a coffee machine,a fridge, a shower, a hair dryer and a wardrobe. The room has a flat-screen TV and a river view. A continental breakfast is served every morning at the property. Guests at Chambre d'hotes Le Fourniou will be able to enjoy activities in and around Melle, like hiking. Niort is 28 km from the accommodation. Poitiers Airport is 55 km from the property. Hotel De l'Argentiere is located in Melle, 20 minutes' drive east of Niort. It offers an onsite restaurant, which serves a range of traditional dishes made using fresh, seasonal produce. The rooms at Hotel De l'Argentiere open onto a terrace and have a flat-screen TV. Each one also has free Wi-Fi access and an en suite bathroom with a bath or shower. After enjoying breakfast in the restaurant or on the terrace, you may choose to drive the 2 km to Saint Hilaire Church. Free private parking is provided on site. Set in a small historical town, 35 minutes’ drive from Niort and 45 minutes’ drive from Poitiers, Le Mouillage Vert is a renovated 19th-century farm with views over the meadows and old oak trees, and free Wi-Fi. The spacious bedrooms are individually decorated and feature visible beams. They come with a bathroom, desk and wardrobe. In the morning, a continental breakfast is served. Le Mouillage Vert features a garden and a sun terrace. There is also a library and a common living room. Saint Maixent l'Ecole TGV train station is 10 km from the B&B and guests can go shopping in La Mothe Saint Héray, 2 km away. There is free parking at the property. Guest accommodation Brux Preferred hotel ! Locaed in a hamlet close to Brux, La Petite Ferme is a pet-friendly holiday home featuring a seasonal outdoor swimming pool, barbecue facilities and a garden. It boasts a fully equipped kitchen and a lounge with a woodburner. The holiday home has 3 bedrooms and 1 bathroom with a hairdryer. A flat-screen TV with satellite channels and DVD player is featured. A continental breakfast option is available every morning at the property. Cycling can be enjoyed nearby and a bicycle rental service is available. Poitiers is 37 km from La Petite Ferme, while Chasseneuil-du-Poitou is 45 km away. Poitiers Airport is 37 km from the property. Guest accommodation Tillou Preferred hotel ! Honeysuckle House is a holiday home set in Tillou and featuring a garden with a seasonal outdoor plunge pool. Guests benefit from free WiFi and private parking available on site. The unit fitted with a kitchen with an oven and microwave. A flat-screen TV with satellite channels, Blu-ray player and DVD player are provided. Other facilities at Honeysuckle House include a barbecue. Free use of bicycles is available at the property and the area is popular for hiking. Niort is 33 km from Honeysuckle House, while Saint-Jean-d’Angély is 38 km away. The nearest airport is Poitiers Airport, 59 km from the property. Situated in Limalonges in the Poitou-Charentes region, Le Cottage Limalonges features a garden. Guests may enjoy the free WiFi. The holiday home features a kitchen with a dining area and a dishwasher, 1 bathroom, and a washing machine. A flat-screen TV with satellite channels is offered. A continental breakfast can be enjoyed at the property. Le Cottage Limalonges offers a barbecue. If you would like to discover the area, hiking is possible in the surroundings. The nearest airport is Poitiers-Biard Airport, 56 km from the property. Set in Limalonges, Le Logis de Limalonges offers accommodation with a patio. Free WiFi is featured. Each unit is equipped with a fully equipped kitchen with an oven, a seating area with a sofa, a flat-screen TV and a private bathroom with shower and free toiletries. Some units have a dining area and/or a terrace. The holiday home offers an outdoor pool. Le Logis de Limalonges offers a barbecue. The nearest airport is Poitiers-Biard Airport, 56 km from the property. Located in Chef-Boutonne, Hotel des Voyageurs features a restaurant, a bar and free Wi-Fi internet access. The property also offers free private parking on site. All of the guest rooms come with a private bathroom, an LCD TV and free toiletries. Traditional dishes are proposed at the restaurant, which has a fireplace and a modern decor. A la carte menus are proposed Tuesday to Saturday, During summertime you can enjoy your meals on the outdoor terrace. La Rochelle - Île de Ré Airport is 87 km away, Cognac is 56 kma way and Poitiers is 73 km from Hotel des Voyageurs. Located 5 km from The Cormenier in Blanzay, Gite La Pommeraie offers accommodation with a kitchen. Guests may enjoy free WiFi. The holiday home comes with a satellite flat-screen TV. The nearest airport is Poitiers-Biard Airport, 49 km from the property. Holiday home Le Marronier is a detached holiday home with a seasonal outdoor pool, set on the grounds of a castle in Ardilleux. Guests benefit from free WiFi and private parking available on site. There is a seating area and a kitchen complete with an oven and a microwave. Guests can enjoy the fire place. Towels and bed linen are offered in this self-catering accommodation. Other facilities at Holiday home Le Marronier include a barbecue. Guests can enjoy the castle facilities, such as the indoor pool and table tennis. You can play tennis at the property, and bike hire is available. Niort is 41 km from Holiday home Le Marronier, while Cognac is 50 km away. Futuroscope park is 85km away. Poitiers Airport is 61 km from the property. Set in an 2-hectare garden and ran by English owners, Château Ardilleux is located in Ardilleux and offers bed and breakfast accommodations. Guests can relax in the indoor pool or enjoy a game of tennis on the courts at the property. The rooms at Château Ardilleuxare individually decorated in a classic style and feature a fireplace. Each room provides a wardrobe and a private bathroom with a bath or shower. Every morning from 8:00 to 9:00, a continental breakfast is served, and upon prior reservation only, the owner can prepare evening meals for guests. The Ruffec Train Station is 23 km away and Château de Javarzay is 2.2 km away. Guests can enjoy the fitness centre at an extra cost, and free Wi-Fi is available in public area at the property. Hostellerie de l'Abbaye is in the village of Celles-sur-Belle and is 13 km from the A10 motorway. It features an on-site brasserie and a restaurant with exposed wooden beams and chandeliers. Free Wi-Fi access and a flat-screen TV are provided in the guest rooms at Hostellerie de l'Abbaye. All rooms have their own bathroom with bath or shower. Breakfast is available every morning and can be delivered to guests’ rooms. Seasonal produce from the market is featured in the restaurant and the brasserie. Guests can also sample a range of local wines. Hostellerie de l'Abbaye is a 1-hour drive from both Futuroscope theme park and the seaside town of La Rochelle. Free private parking is provided. Located in Chef-Boutonne, Le Moulin de Lusseau offers a garden, terrace and free Wi-Fi access in the public areas. Niort is only a 45-minute drive away. All rooms are decorated in a modern style and feature a view of the garden and tea and coffee making facilities. The en suite bathroom includes a hairdryer. A continental breakfast serving hot drinks, jam, bread, pastries and milk is provided each morning at Le Moulin de Lusseau. Restaurants can be found in Chef Boutonne, a 5-minute drive away and in Melle, an 18-minute drive away. Additional features include free private parking on site and central heating. Javarzay Lake is only 5 km from the property. Offering an indoor swimming pool, a hot tub and children’s playground, Chalet de la Héronnière is a holiday park offering cottages with free WiFi, 16 km from Melle. The cottages will provide you with a terrace and a seating area. They also have a full a kitchenette with a refrigerator, oven, microwave and kitchenware, and a private bathroom with a shower. Breakfast is available upon request and includes bread and pastries. Other meals must be booked in advance. An array of activities can be enjoyed on site or in the surroundings, including fishing, crazy golf at an extra cost and poney trekking in season. There is also a wellness room guests guests can enjoy massages, a Turkish bath and a sauna at a cost. This holiday park is 25 km from Ruffec Train Station and 45 km from Niort. The property offers free parking. Featuring accommodation with a private pool, Maison De Vacances - St. Macoux is located in Saint-Macoux. This property offers access to free WiFi. The holiday home features a TV and 3 bedrooms. The accommodation is fitted with a kitchen with a dishwasher and an oven. The holiday home offers a barbecue. Guests can also relax in the garden. The nearest airport is Poitiers-Biard Airport, 59 km from the property. Guest accommodation Fontenille-Saint-Martin-d'Entraigues Preferred hotel ! Offering free WiFi and a garden, Moulin De Coupigny is located in Fontenille-Saint-Martin-d'Entraigues. Niort is 33 km from the property. Free private parking is available on site. The accommodations feature a seating area and a private garden. Each unit also has a kitchen, fitted with a dishwasher, oven and microwave. A fridge is available, as well as a coffee machine and a kettle. Bed linen is featured. Moulin De Coupigny also includes a barbecue. You can play tennis at the property, and the area is popular for cycling and fishing. Cognac is 50 km from Moulin De Coupigny. The nearest airport is Poitiers Airport, 62 km from the property. Below here is the hotels map of Sainte-Soline. Names and details of Sainte-Soline hotels can be shown on the map clicking on the prices icons.